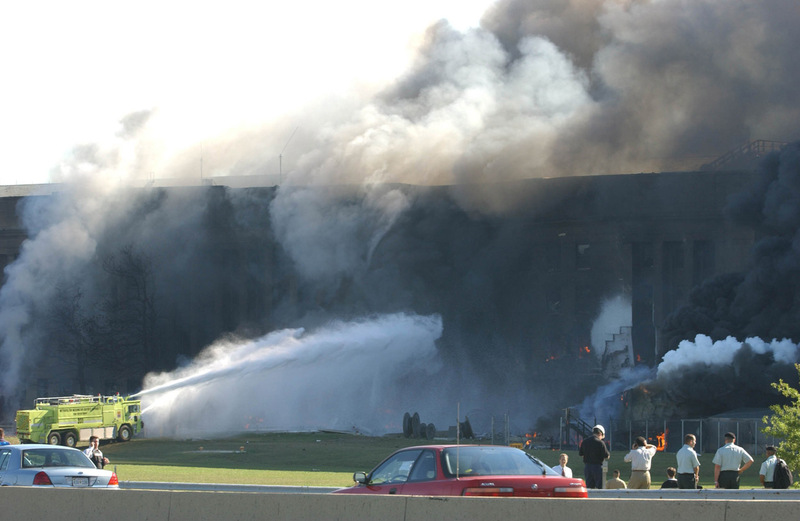 This composite image shows the extent of damage to the Pentagon facade before it collapsed, and the proportional size of the Boeing as it approached. (Source: http://0911.site.voila.fr/index2.htm ). How is it possible that the jetliner could have passed through that tiny hole? A team of computer scientists and engineers at Purdue University ran a simulation study to illustrate the dynamics of a 757 strike against the Pentagon. Their study showed the 757 penetrating the Pentagon facade across the entire width of the wings of the airplane, which is a surprising finding as we will show below -- and is also quite different from what actually happened, as the wings clearly did not penetrate the facade. As noted in the Purdue report, there is an extensive literature regarding the effects of impact of aircraft on reinforced concrete structures. 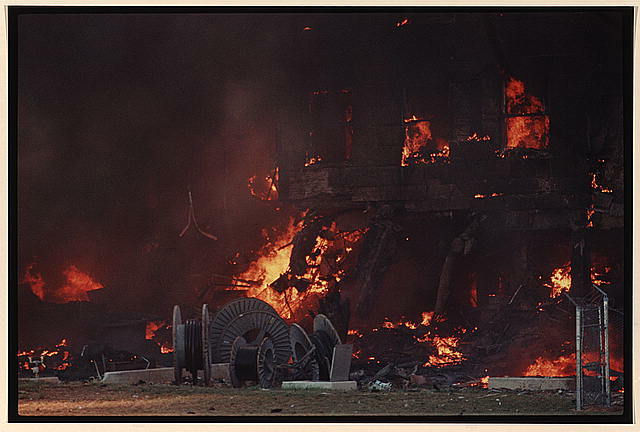 The question is important because of the possible effects of an air crash (such as, for example, a terrorist attack) onto the concrete containment of a nuclear power plant. The studies indicate that it is difficult for an aircraft to penetrate a blast-hardened, reinforced concrete containment. 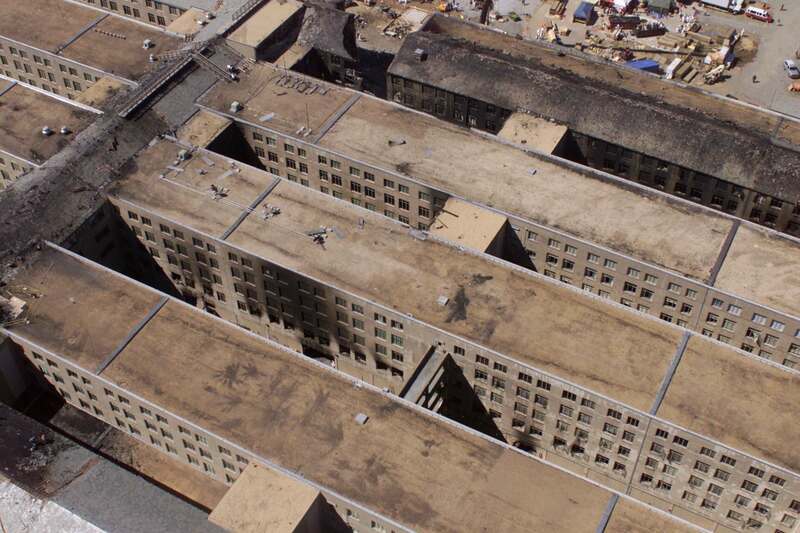 While the construction of the Pentagon is not strictly comparable to a nuclear containment vessel, nevertheless the western wedge had recently been rehabilitated for high blast resistance. We attempted some basic calculations (see appendix I) and found that the Pentagon structure may well have been strong enough to resist destruction by an aircraft such as a 757 flying at speeds less than 200 to 300 mph, and at any rate that the partial survival of some columns is not totally surprising. The purpose of the test was to determine the impact force, versus time, due to the impact, of a complete F-4 Phantom -- including both engines -- onto a massive, essentially rigid reinforced concrete target (3.66 meters thick). 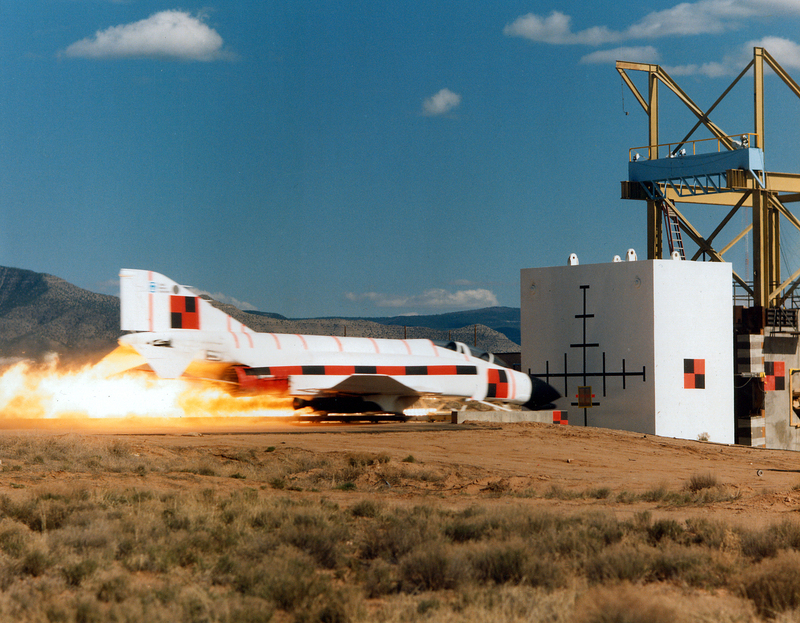 Previous tests used F-4 engines at similar speeds. 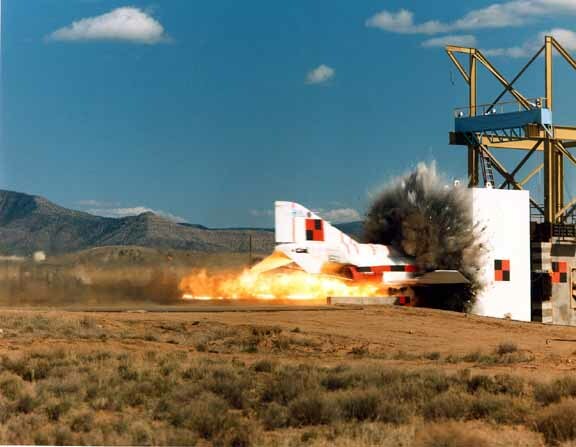 The test was not intended to demonstrate the performance (survivability) of any particular type of concrete structure to aircraft impact. The impact occurred at the nominal velocity of 215 meters per second (about 480 mph). The mass of the jet fuel was simulated by water; the effects of fire following such a collision was not a part of the test. 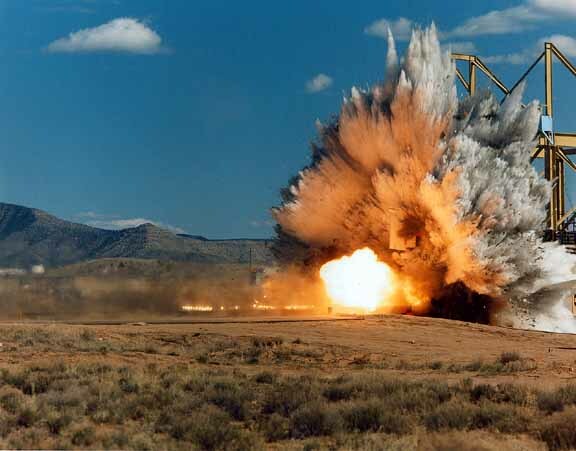 The test established that the major impact force was from the engines. The test was performed by Sandia National Laboratories under terms of a contract with the Muto Institute of Structural Mechanics, Inc., of Tokyo. With very minimal damage to the concrete target block, the plane and its engines were easily converted into small chunks of metal confetti and shrapnel at the physical interface of the two impact objects. Upon initial impact, the follow-on rear portions of the plane yet to make contact retained their shape integrity until their respective impact. (This seriously contradicts claims by Jean-Pierre Desmoulins that the wings of a 757 would have folded forward, as well as claims in the popular press that the wings folded back before entering the "too-small" hole.) The resulting shear caused debris being spread out to the left, right, and rear of the impact locus, having no ability to proceed in their original vector path, having grossly failed the test of strength with the concrete block. However, the wings are wider than the concrete block, so the wingtips are sheared off whole, and they tumble forward after being cleanly separated from the aircraft. Sugano (in itself) doesn't show that a 757 hitting the Pentagon would be turned into confetti and small chunks, but it does show that an F4 was completely destroyed in arguably similar circumstances. Furthermore, it wasn't anywhere close to an even contest between the wall and the F4. The F4 started with a speed of 215 m/sec -- and the tail was still traveling at 185 m/sec when it smashed into the wall. The F4 is a very strongly build aircraft, although at 18 meters long and 19 kg, it's about a third the length and a fifth the weight of the 757. In terms of comparing what would happen to a 757 versus what happened to the F4, it would be difficult to do an accurate calculation without detailed design information on both aircraft. In a preliminary analysis, the extra length of the 757 means that it has three times the distance to decelerate -- but the 757 is also much heavier, so it's more difficult for the crushing process to supply enough force to decelerate even as rapidly as the F4 did. Another contrast is between the construction of the target for the Sugano experiment, as compared to the Pentagon. 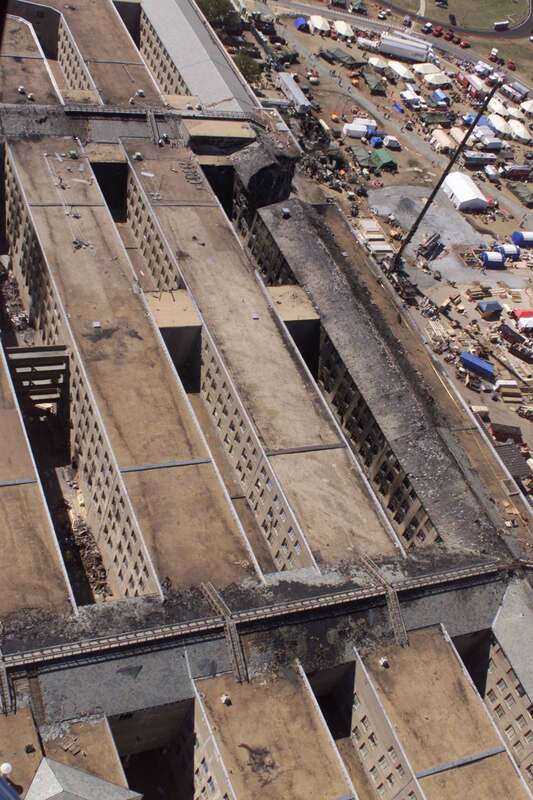 While the Pentagon has only 10 inch thick brick and masonry infill walls, the facade's columns spaced 10 feet apart were concrete reinforced with spiral wound and axial steel rebar, and were supposed to have been reinforced during the building's renovation project in this very section. In the direction vector of the plane, the second story concrete floor slab was effectively contiguous for approximately 300 feet. 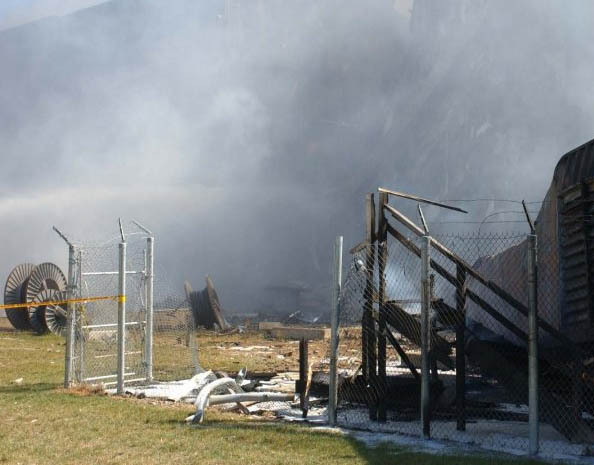 Additionally, the plane's wings had to hit the electrical generator to the right and contractor's trailers to the left before possibly impacting the building. While (according to the ASCE report) the fuselage and core portion of the airplane were able to penetrate the facade and enter the building, the outer portions of the wings, and the tail, definitely did not penetrate the facade -- and thus that portion of the plane (at least) should have been converted to small fragments. Proceeding cautiously to apply the Sugano results -- we believe that the Sugano experiment may present a possible counter-argument against two of the most widely cited arguments for the "no 757" theory at the Pentagon: the "too small" hole, and the "missing wings" and tail. According to our detailed analysis (presented below in Appendix I), the hole appears to be too small because the wing-tips and tail were not massive enough to penetrate the facade, and in some cases the columns were also strong enough to survive (or partially survive) the onslaught of the airplane's core. Furthermore, we should expect no recognizable remnants of the wings and tail because they should have been smashed into small pieces and spread all over the Pentagon lawn. If the wings & tail of the 757 hit the Pentagon wall, why can't we see any clear signs of impact? The fuselage of the F4 crashing into the concrete block wall, left an indentation 2cm deep, while the engines (more heavily constructed than the 757 tail for sure) left indentations 6cm deep. But with all the smoke and foam in the photographs taken immediately after the crash, it is difficult to be confident that even this amount of damage would be clearly visible. It is also odd that the wings didn't do more damage to the windows, although without specific data, it is difficult to know whether the impact would have exceeded their blast resistance capabilities. Indeed, it is possible that the wings and tail might have missed the windows completely. The Sugano results may also explain the bizarre appearance of videos showing the WTC aircraft disappearing into those buildings like knives into butter, without slowing down. The force exerted backwards from the crash through the airframe is not sufficient to cause significant deceleration of the parts that haven't impacted yet, at least from a visual point of view. In the case of the F4 experiment, although the airframe behind the crash zone experienced a 100G deceleration, this was only sufficient to slow the tail by 30 meters per second (out of 215 meters per second) during the 70-millisecond duration of the impact. We do not claim that the Sugano results can be used to definitively establish exactly what the hole in the Pentagon should have looked like, if it in fact had been struck by a 757. Due to the many complexities of the structural analysis of such a crash, the exactly "correct" impact hole size and shape is simply an imponderable for both the crime scene investigator and the perpetrator alike. What we are saying, is that the hole in the Pentagon does appear (at least in its basic size and shape) as a plausible outcome of a 757 crash, although questions do remain about the specific nature of damage to the columns and the interior features of the Pentagon offices. 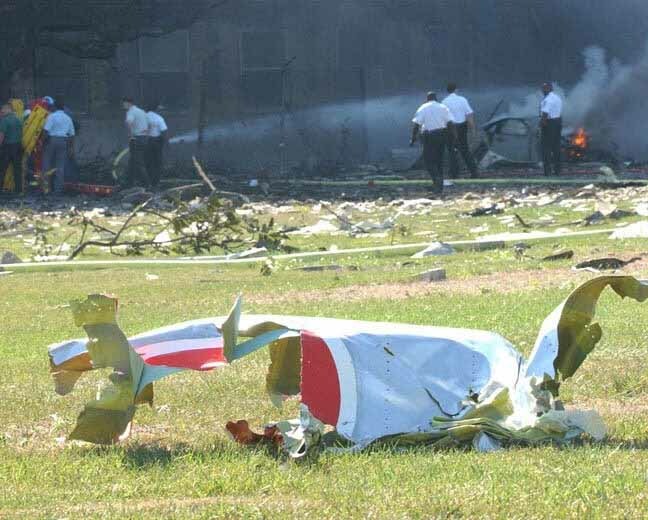 We turn to the photographic record of the Pentagon crash to evaluate the evidence of a debris field sufficiently extensive to account for thousands of pounds of wing structure. The background of this image above shows significant amounts of debris immediately to the northwest of the crash site. 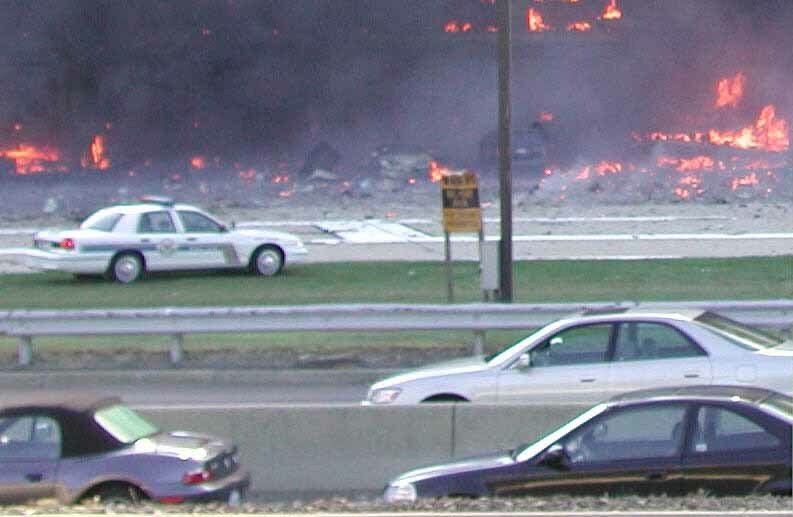 This image appears to have been taken with a telephoto lens from near the Pentagon road, and the debris field appears to be quite dense out to about 75 meters from the Pentagon. But it is difficult to say how much of it is aluminum from an aircraft, and how much is paper, limestone, and other debris from the explosion, such as material from the contractors' trailers. If the debris field is round in shape and approximately 75 meters in radius, its surface area is about 4500 square meters. In Appendix I we estimate the mass of the wingtips which must have reflected off the walls as approximately 10,000 pounds, and the tail might add another 5000 pounds. This seems like a lot of aluminum, but spread over a 4500 square meter area, it is only 3 pounds per square meter, or 1/3 pound per square foot. Put another way, the area of the wingtips and tail is approximately 100 square meters, so the area coverage of the surfaces spread out over the debris field would be around 2%. 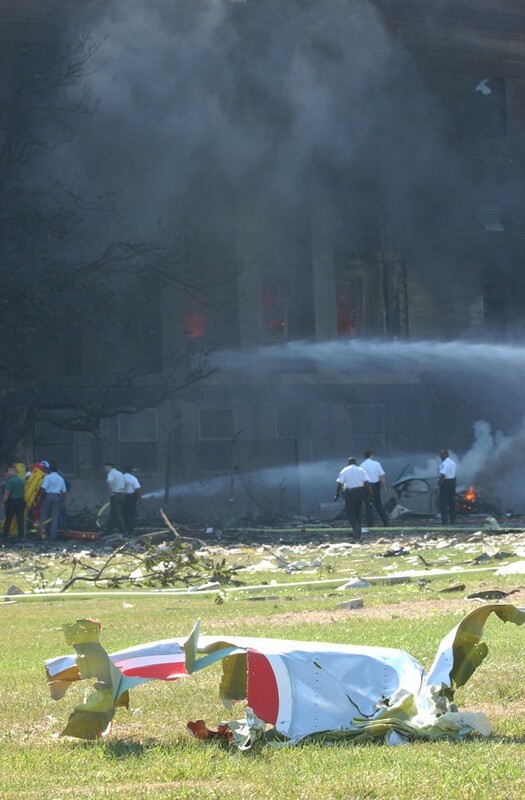 In the foreground, this shows a widely-debated, large piece of debris, whose appearance comports with the starboard fuselage of the American Airlines 757. Some investigators have argued that it strains the bounds of credulity, that this piece of the fuselage could have been thrown so far from the opposite side of the aircraft at impact. Yet, if we imagine that the fuselage was involved in a process of crashing into and reflecting off of the Pentagon wall (before penetration could be achieved) then perhaps this can be comprehended as a bizarre fluke. 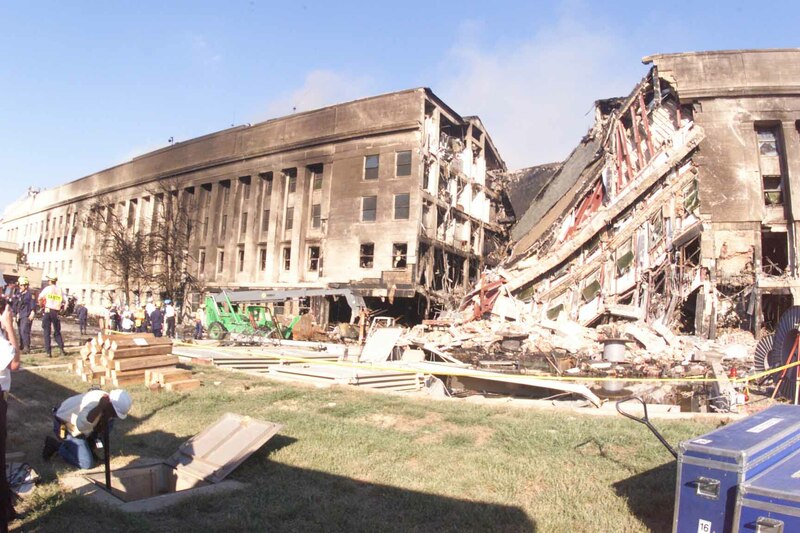 The piece might even have entered the Pentagon along with the rest of the fuselage (after the facade was penetrated) and then been ejected through an open window. In view of the many questions that have been raised (Is the sheet metal too thin? Is the lettering the correct size? Is the paint the correct color?) this piece should be on display in a museum. Yet Christopher Bollyn states that "...the large piece of debris that appeared to be from an American Airlines jet has not even been inventoried by the Dept. of Defense. As a journalist for American Free Press in Washington, I have tried repeatedly to get the Pentagon to clarify the status of this important piece of debris that was seen by millions. As of this date there has been NO response to numerous requests." Furthermore, many eyewitnesses stated that they were showered with debris at locations far away from the visible debris field. In this next photo (above) by witness Steve Riskus, we see some indeterminate debris on the helipad, but the grass and the highway look clear. This picture of the highway, http://www.criticalthrash.com/terror/P1010013.JPG (also by Riskus), doesn't show much confetti -- although there is one chunk (which might also be a fast-food wrapper), next to the standing man carrying what looks like a bicycle tire. Many other images of the scene at the Pentagon, anywhere further than 75 meters from the impact site, show little if any visible debris. This seems to contradict eyewitness testimony of large amounts of debris falling at sites as far away as Washington Boulevard, Highway 27. However, it is possible that there was a rain of small particles, in size ranging from a grain of sand to a small pebble. This sort of debris would be fearfully loud and somewhat dangerous, even though it might be invisible in these specific photographs. Mark Faram stated clearly that "All over the highway were small pieces of aircraft skin, none bigger than a half-dollar" but you can search far and wide in the photographic record for anything, anywhere near the size of a half dollar, anywhere near the highway. Please take the time to review the extensive list of of high resolution photo links that we have provided at the end of this section for further comparison, as well as the eyewitness testimony on confetti compiled by Eric Bart. This image of the generator trailer (above, source: http://www.tradoc.army.mil/pao/viwebpage/pentagonattackrescue/pages/07my8.htm) clearly shows an absence of debris at exactly where the ASCE's star witness, Frank Probst, said that he saw "bits of metal and concrete drifting down like confetti". According to the official story, the starboard engine crashed through the fence at this point, and then apparently either the engine and / or or the wing section just outboard of the engine struck the generator which was sitting a few feet behind the fence. The crash of the engine against the trailer should have produced a crush of metal against metal, creating an explosive cloud of debris (similar to the Sugano experiment) which would have been thrown towards the Pentagon crash site. The critical engine metal being very strong, yet brittle, and much of it rapidly spinning with a great deal of centrifugal force available. Yet the grass ahead of this impact site looks remarkably undisturbed, as does everywhere else outside of the otherwise indeterminate debris field previously discussed. The absence of visible confetti in the images might be explained if the confetti tended to disappear into the grass, hidden among the blades. Also, we have not actually provided any measure of the resolution of the images, to demonstrate the size of confetti which might be resolved. The fact that some witnesses exclusively testified to a lack of confetti, might be explained by a similar effect: they didn't see the confetti because it was hidden in the grass. 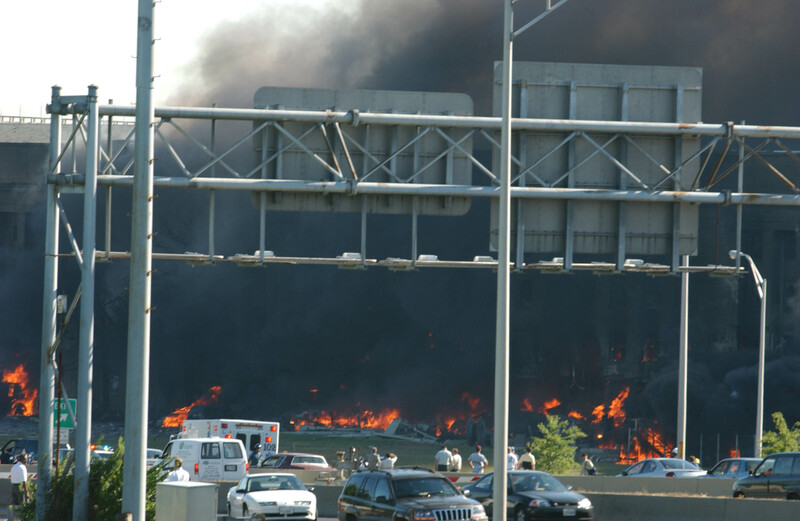 On January 8, 2002, BPS team leader Paul Mlakar interviewed three eyewitnesses-two of whom witnessed the impact of the aircraft and one of whom witnessed the subsequent partial collapse of the building. All three are professional staff members of the Pentagon Renovation Program Office and collectively provide a coherent and credible account of the events. Frank Probst, 58, is a West Point graduate, decorated Vietnam veteran, and retired army lieutenant colonel who has worked for the Pentagon Renovation Program Office on information management and telecommunications since 1995. At approximately 9:30 A.M. on September 11 he left the Wedge 1 construction site trailer, where he had been watching live television coverage of the second plane strike into the World Trade Center towers. He began walking to the Modular Office Compound, which is located beyond the extreme north end of the Pentagon North Parking Lot, for a meeting at 10 A.M. As he approached the heliport (figure 3.2) he noticed a plane flying low over the Annex and heading right for him. According to the Arlington County after-action report (Arlington County, 2002), this occurred at 938 a.m. The aircraft pulled up, seemingly aiming for the first floor of the building, and leveled off. Probst hit the ground and observed the right wing tip pass through the portable 750 kW generator that provides backup power to Wedge 1.The right engine took out the chainlink fence and posts surrounding the generator. The left engine struck an external steam vault before the fuselage entered the building. As the fireball from the crash moved toward him, Probst ran toward the South Parking Lot and recalls falling down twice. Fine pieces of wing debris floated down about him. The diesel fuel for the portable generator ignited while he was running. Don Mason, 62, is a communications specialist who retired from the United States Air Force after 25 years of service. He has worked for the Pentagon Renovation Program Office on information management and telecommunications since 1996. At the time of the crash he was stopped in traffic west of the building. The plane approached low, flying directly over him and possibly clipping the antenna of the vehicle immediately behind him, and struck three light poles between him and the building. He saw his colleague Frank Probst directly in the plane's path, and he witnessed a small explosion as the portable generator was struck by the right wing. The aircraft struck the building between the heliport fire station and the generator, its left wing slightly lower than its right wing. As the plane entered the building, he recalled seeing the tail of the plane. The fireball that erupted upon the plane's impact rose above the structure. Mason then noticed flames coming from the windows to the left of the point of impact and observed small pieces of the facade falling to the ground. Law enforcement personnel moved Mason's vehicle and other traffic on, and he did not witness the subsequent partial collapse of the building. Rich Fitzharris, 52, is an electrical engineer and a former residential contractor. He has been the operations group chief of the Pentagon Renovation Program Office since 1996. He was in the Modular Office Compound at the time of the crash and rushed to the site on foot, arriving before the partial collapse. He recalls that the building-near the area of impact-was in flames, and he remembers seeing small pieces of debris, the largest of which might have been part of an engine shroud. He was at the heliport when a portion of the structure collapsed. The collapse initiated at the fifth floor along the building expansion joint, proceeded continuously and was completed within a few seconds. 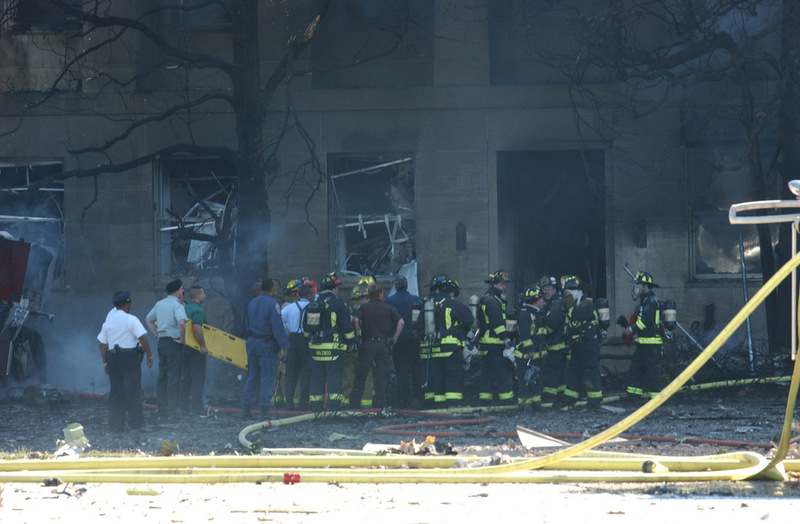 According to the Arlington County after-action report, this occurred at 957 a.m., or 19 minutes after impact. Exactly 60 years later, half the world was watching the World Trade Center burn on television on the morning of Sept. 11, 2001. Frank Probst was one of them. A Pentagon renovation worker and retired Army officer, he was inspecting newly installed telecommunications wiring inside the five-story, 6.5-million-square-foot building. The tall, soft-spoken Probst had a 10 a.m. meeting. About 9:25 a.m., he stopped by the renovation workers' trailer just south of the Pentagon heliport. Someone had a television turned on in the trailer's break room that showed smoke pouring out of the twin towers in New York. "The Pentagon would make a pretty good target," someone in the break room commented. The thought stuck with Probst as he picked up his notebook and walked to the North Parking Lot to attend his meeting. Probst took a sidewalk alongside Route 27, which runs near the Pentagon's western face. Traffic was at a standstill because of a road accident. Then, at about 9:35 a.m., he saw the airliner in the cloudless September sky. American Airlines Flight 77 approached from the west, coming in low over the nearby five-story Navy Annex on a hill overlooking the Pentagon. "He has lights off, wheels up, nose down," Probst recalled. The plane seemed to be accelerating directly toward him. He froze. "I knew I was dead," he said later. "The only thing I thought was, 'Damn, my wife has to go to another funeral, and I'm not going to see my two boys again.'." He dove to his right. He recalls the engine passing on one side of him, about six feet away. The plane's right wing went through a generator trailer "like butter," Probst said. The starboard engine hit a low cement wall and blew apart. He still can't remember the sound of the explosion. Sometimes the memory starts to come back when he hears a particularly low-flying airliner heading into nearby Reagan National Airport, or when military jets fly over a burial at Arlington National Cemetery. Most of the time, though, his memory is silent. "It was pretty horrible," he said of the noiseless images he carries inside him, of the jet vanishing in a cloud of smoke and dust, and bits of metal and concrete drifting down like confetti. On either side of him, three streetlights had been sheared in half by the airliner's wings at 12 to 15 feet above the ground. An engine had clipped the antenna off a Jeep Grand Cherokee stalled in traffic not far away. "I was standing on the sidewalk (parallel to the site of impact)...and I saw this plane coming right at me at what seemed like 300 miles an hour. I dove towards the ground and watched this great big engine from this beautiful airplane just vaporize," said Frank Probst, a member of the Pentagon renovations crew commented. "It looked like a huge fireball, pieces were flying out everywhere." But if Probst were near the heliport, he would not have been in position to see details such as the clipped antenna on the Jeep Cherokee. So in the later version of the testimony, we find that Probst has been moved off the sidewalk, and his co-worker Don Mason has been brought in as the source of the information about the lamp poles and the clipped antenna (as well as to assure us that he did indeed see Probst standing there in the path of the oncoming plane.) While a cynical reader might suspect that certain details have been conveniently altered to "collectively provide a coherent and credible account of the events", we must admit the possibility of confusion in the early reports. The heliport does look a little bit like a sidewalk, and perhaps Probst has very good distant vision. However, we still must ask how Frank Probst had the amazing presence of mind to observe the plane coming straight towards him at a speed of 300 to 450 mph, see it level out, dive to the ground, and still manage to see both engines as they impact objects outside the building. These impacts would have required him to have also altered his field of vision by almost 180 degrees concurrently with diving, during the last milliseconds of the plane's flight. All this after just being missed by one of the engines by 6 feet, and not being turned into a whirling dervish, or otherwise severely disoriented by the blast of air. Finally, while Probst claims that debris drifted down around him, the video of the Sugano event shows debris reflecting off the wall with tremendous momentum and velocity, like shrapnel from a bomb. We ask whether Probst sustained at least a few scratches from all the shrapnel. It may seem amazing that Frank Probst could be so sincere in his testimony, and yet at the same time so badly mistaken. The authors have been down a long journey, questioning how that could be possible, and now we believe we know how it is done. For those who might like to take the same journey, some good places to start are www.hypnotism.org and http://www.rossinst.com/bluebird.htm . Brian Salter pointed out that the ASCE report could possibly be interpreted as placing Probst on the sidewalk. Or, we would add, perhaps the ASCE reporter misunderstood where Probst was located, while the early report was correct. In the early report, the suggestion that the altitude of the plane was low enough to pass 6 feet away from Probst, and low enough to be trimming the antenna of an automobile on the road, is certainly wrong. The light pole evidence seems to indicate an altitude closer to 30 feet. An altitude of 30 feet might also explain why the automobiles were not tossed by wake turbulence, and why Probst was able to survive the jet blast. Liquid Hammer Jet Fuel Induced Concrete Erosion, As Per Purdue? The Purdue simulation shows a computer modeled 757 impacting into a representation of the Pentagon. It is interesting for several reasons. "A basic hypothesis, informally confirmed with engineers knowledgeable in this subject, is that the bulk of the impact damage is due to the body of fuel in the wing and center tanks. Most of the aircraft structure is light-weight low-mass, and relatively low strength, with the exception of the wheel undercarriage." Based on this hypothesis, Purdue built an elaborate model of the effects of fluid on reinforced concrete. However, the Sugano paper actually did specifically attempt to account for the effects of fuel in aircraft impacts. The F4D fuel tanks were filled with water, which was presumed to have similar mechanical properties to jet fuel. No special damage was notably caused by this fluid, apart from the expected force of impact as predicted by the momentum equation. · Ostensibly due to manpower and computational limitations, several aspects of the event were not modeled. This includes the effect of the column infill walls, the new blast resistant windows, and the newly added reinforcement steel, the debris containment mesh, and the second story floor slab and everything above. This allowed for the survival of major sections of the simulated 757 tail section. Also, it appears that fuel was left in the wings clear out to the extreme wingtips, as these also penetrated the simulation building in contrast to the real event. Of course, all these details that are missing, or excessive, might possibly allow for some wiggle room for when tough questions arise. It can be stated that it was not the project's scope to create a perfect model, just enough to show the 'major' effects to the columns. · The damage to the columns seen in the simulation were 'calibrated' to the actual columns by empirically adjusting the simulation parameters until a match was obtained. Of course, we are left to wonder as to how compliant the calibration is to reality considering all the possible variables that may have been omitted, and all the structural elements that actually were left out. · By advancing frame by frame one can see the engines vanish as if being subsumed underneath the ground level floor. While it could be understood that it may be somewhat imponderable to decide on the precise lateral point of impact and the effect of the retaining wall on the mechanical integrity of the port engine (especially since it should have also hit the bed of one of the contractor's trailers first), we can see that the starboard engine has an elevation problem simply because the starboard wing has been modeled at such a low elevation so as to attempt to reproduce the actual column damage along the right side where the columns remained attached to the ceiling and bent back. Yet the plane was supposed to still be maintaining a bank to the left such that the starboard wing impacted high enough to cross the second story floor slab. · The simulation did not attempt to render the wire spools to 3D even though their dark 2D circles can be seen in the Space Imaging satellite photo used from 9/7/2001, 4 days before the event. The simulated plane merely flies right over them. The aspects of the simulation which were left out lead us to an interesting question. If we are to assume that the observed bread slicing / cheese grater effect seen in the simulation is correct, then based upon the most conservative alignment of the plane with the building, a significant upper slice of the fuselage should have been sliced off by the second story floor slab as the alleged 757 made its entrance. This portion of the fuselage should be something on the order of 1/3 of the fuselage circumference. Most of this aluminum material should have then proceeded further into the building and as per the rest of the simulation, the bulk of that should have proceeded past the column 11 expansion joint collapse seam. This is important because this material would be sequestered from any fire and fuel from the plane. Protected from the ground floor fire by the effect of the concrete floor further in, and from the fuel by the fact that the port wing and fuselage tank fuel would only apply to the ground floor level as would most all of the balance of the fuel in the starboard wing (that is, any wing fuel also left over from the impacts with the generator and the trailers). Any possible hydrogen from Jean-Pierre Desmoulins' claimed chemical reaction would gravitate to the ceiling of the second floor, not to the floor where the debris would rest. There is no sign of possible fuel entry to the second floor except possibly via one or two windows impacted by the starboard wingtip, in any case too far from the fuselage debris of this scenario. Arguably, in this scenario there should have been much more severe damage to the second floor, and at any rate large quantities of fuselage debris should have been found in the second floor. However, we have no proof that fuselage debris was not actually found on the second floor. Based on the Sugano et al. paper, we have attempted to calculate the forces that would be involved in a hypothetical crash of a 757 against the Pentagon. The results are tantalizing yet uncertain. If the impact of the "757" occurred at a relatively low velocity, such as 200 mph, it seems questionable whether any part of the aircraft would have penetrated the Pentagon wall. On the contrary, the plane probably should have been entirely smashed and shredded. Furthermore (and perhaps this is the most important point) if we're making this calculation correctly, the planners of the operation would have been aware of the problem, which might have led to the logistical decision to use pyrotechnics and / or a missile or missiles to penetrate the facade. 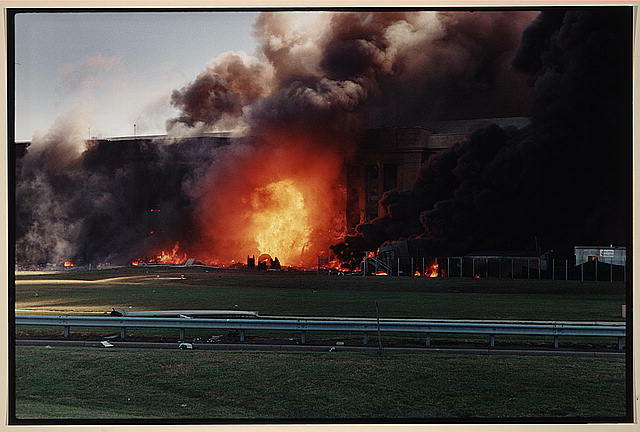 At high speed (400-500 mph) penetration of the facade is much more likely (though perhaps not certain) -- yet a high-speed attack directed at the first floor of the Pentagon would have been difficult to carry out accurately with a 757, because of turbulence and ground-effect. There are enough uncertainties in this calculation, that we would be very uncomfortable claiming that it would be *impossible* that any part of the aircraft would have penetrated the facade. But, if it is accepted (based on other evidence) that 9/11 was an inside job, then this analysis may help to explain why the planners might have decided to use missiles or pyrotechnics, rather than relying on a 757. There is a similar situation with the WTC towers -- the planners could hardly have tolerated the uncertainty of an uncontrolled collapse -- so they would have needed to place some explosive charges, to prevent the towers from tipping sideways and destroying all of Wall Street. According to Sugano et al, by far the most important determinant of the impact force is the term F=alpha*V^2*u, where u is the mass (per unit of length) of the airframe which is abruptly smashed against the wall, and alpha is a correction factor equal to 0.9. So if we use the figures in the ASCE report for the weights and dimensions of the 757 aircraft, and apply some reasonable assumptions about the distribution of mass within the wings, we can estimate the impact forces fairly accurately. The wings of the 757 are tapered from the roots to the tips; from the drawing in the ASCE report, we estimated a chord length of 8 meters at the roots, 5 meters at 7 meters out, and 3 meters at the tip. The thickness of the wing is tapered proportionately, so the mass of the wing's structure should be roughly proportional to the square of the chord. The ASCE report says the mass of the wing structure is 13,500 pounds in each wing. If this mass is distributed as the square of the chord length, then 8750 pounds of this is located within the first 7 meters of the wingspan, while the remaining 4750 pounds are in the tips. Furthermore, the engines weigh 11,900 pounds each, and the landing gear weighs 3800 pounds. The fuel mass is 14,600 pounds for each wing, and since the tanks were partly empty, most of this mass would have run towards the lowest part of the tanks (that is, towards the center). Thus, we have a total of as much as 39,050 pounds in each of the wing roots, and only 4750 pounds in the tips (the outer 10 meters of the wingspan.) This should make it clear that the penetrating power of the extremities of the aircraft should be quite limited compared to the penetrating power of the core portions. Using F=alpha*V^2*u, alpha=0.9, we can estimate the force loading for each linear foot along the width of the airplane. We used a velocity of 90 meters/sec (200 mph) although it's very possible the "aircraft" was traveling much faster. We can also calculate the pressure in psi, using estimates for the cross-sectional area of each part. We obtained the following values: wingtips, 21,000 lbs / ft (152 psi); wing roots, 200,000 lbs / ft (413 psi); fuselage, 111,000 lbs / ft (83 psi); engines, 200,000 lbs / ft (221 psi). All of the psi loading values are well below the yield strength of concrete, which is about 3000 psi. We also need to look at the overall loading of forces onto the columns of the structure. This is much more difficult to estimate, since it's hard to say how much of the load bearing on the limestone and brick infill would be coupled into the columns, and how much would be directly transferred into deflection of the limestone & brick. But if we assume that the force on the columns comes only from the portion of the aircraft bearing directly on those columns, then we can use the values for lbs / ft directly, for our load estimates on the columns. For 12" square beams with 8 square inches of rebar-cross-sectional area, 1" cover, concrete cylinder strength=3000psi, steel yield strength=45000psi (values estimated from the ASCE report) the calculator returns a moment capacity of 1812 in*kips. the load-carrying capacity of a beam loaded at the center, is equal to the moment capacity divided by 4. If this is correct, then the capacity of the Pentagon columns, treated as beams for a horizontal load, would be 450,000 pounds. This is greater than any of the estimated loads per linear foot, by more than a factor of 2. And, it is far greater than the estimated wing-tip loading. If the "aircraft" were traveling at 400 mph, all the load figures would be quadrupled, indicating that the beams would be unlikely to survive, except at the wingtips. Donald R. Bouchoux, 53, a retired Naval officer, a Great Falls resident, a Vietnam veteran and former commanding officer of a Navy fighter squadron, was driving west from Tysons Corner to the Pentagon for a 10am meeting. He wrote At 940 a.m. 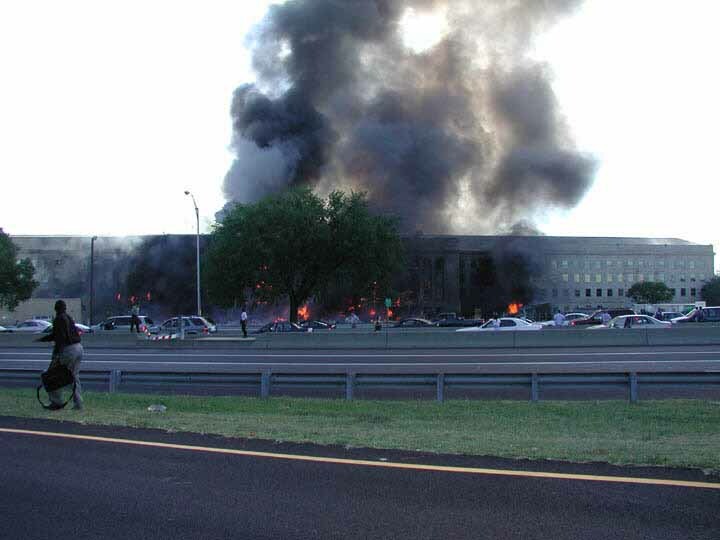 I was driving down Washington Boulevard (Route 27) along the side of the Pentagon when the aircraft crossed about 200 yards in front of me and impacted the side of the building. There was an enormous fireball, followed about two seconds later by debris raining down. Around 940 a.m. I reached the heliport area (beside the Pentagon). So I got about 100 yards or so past the heliport and then all of the sudden I heard this loud screeching sound that just came out of nowhere and it intensified. This huge WHOOSH! When I looked up I saw the side of the Pentagon explode. As the fireball got higher and higher, you saw this debris go up in the air. I am watching this in my rearview mirror, and then I thought, Oh my God, there is debris coming toward me! So my reaction was, I ducked into my passenger seat and I heard the pitter-patter of pebbles and concrete bouncing off my car. And the next thing you know, I heard this big crash come from somewhere. It sounded like glass being shattered and I thought maybe, at first, it was one of my windows so I popped up to look but everything was fine. But when I looked to the car next to me I realized that something went through (the drivers) rear windshield and shattered it. There was a hole where you could see that something went through it. Then both I and the guy in front of me looked at his rear windshield and saw what was about a four-inch hole in it and the rest of the window was shattered as if someone took a baseball bat to it. At that point I didn't know it was a plane, I thought it was a missile strike. http://www.amazon.com/exec/obidos/tg/detail/-/1592090281/qid=1073629908/sr=1-2/ref=sr_1_2/104-9442390-8503911?v=glance&s=books Pentagate book, with a review by Christopher Bollyn stating that "...the large piece of debris that appeared to be from an American Airlines jet has not even been inventoried by the Dept. of Defense. As a journalist for American Free Press in Washington, I have tried repeatedly to get the Pentagon to clarify the status of this important piece of debris that was seen by millions. As of this date there has been NO response to numerous requests." http://www.photolibrary.fema.gov/photolibrary/index.jsp a cache of high resolution FEMA photos to the interior of the Pentagon and before that WTC pics. Please note pic IDs 4414 and 4415 for the engine rotor. Observe 4421, 4429, 4430 and 4431 for interesting debris. Click on the thumbnail to get a link to the high resolution download. http://www.tradoc.army.mil/pao/viwebpage/pentagonattackrescue/pages/07my8.htm - The starboard engine hole in the chain link fence? http://renovation.pentagon.mil/Phoenix/9-11-2001/f07-66641855-1.jpg - odd facade, sheet metal or masonry? http://www.news.navy.mil/management/photodb/photos/010911-N-6157F-001.jpg - Besides the famous debris, where is half-dollar sized confetti. 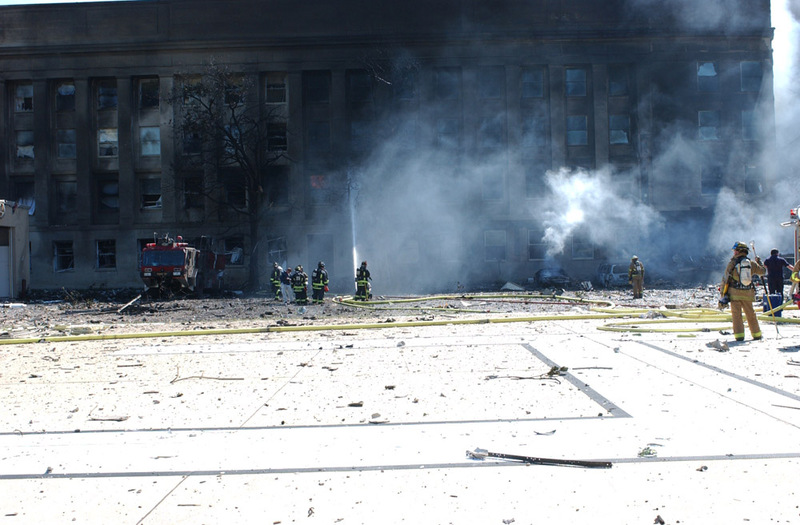 Is the further debris from a plane, the trailers, or masonry? http://criticalthrash.com/terror/P1010016.JPG - Why is the concrete column #8 burning? Pyrotechnics? This column's facade masonry came off, yet it was not struck by the alleged wing. http://www.geoffmetcalf.com/pentagon/images/3.jpg What's going on with the electrical generator? Is it in the right spot? http://www.geoffmetcalf.com/pentagon/images/13.jpg Debris field or demolition ejecta and salted wreckage? Sgt Francis W. Pomrink Jr., a Classified Materials NCO, was at work in his office in the Department of Marine Aviation. Most of Marine Aviation had just the weekend before been moved to the "Butler building," an extension of the Pentagon and about 200 yards from where the impact occurred, not nearly as close as their previous offices. Pomrink heard the jet engine noise of a rapidly approaching jet and a muffled rumbling explosion, then the floor shivered beneath him. 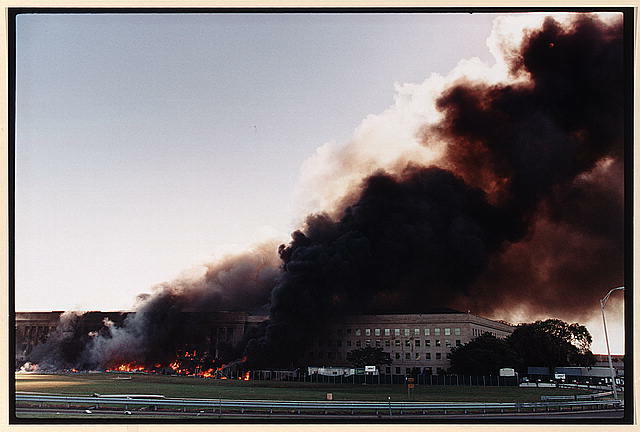 He went outside and could see the smoke rolling up and flames shooting over the top of the Pentagon. http://www.cs.purdue.edu/cgvlab/projects/popescu/pentagonVis_files/pentagonVis2003.mpg Simulation video. Note here that they represent the fuel being carried well inside the building.